NewCloud’s Dallas Cloud Hub is located in the iconic Univision Tower data center operated by Digital Realty (formerly Telx). The facility at 2323 Bryan St. is home to over 60 carriers, making it a centrally interconnected and colocation hub, especially popular among leading communications providers from North America, Latin America, Europe, and Asia-Pacific countries. 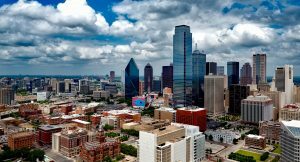 The Dallas metro area is one of the fastest growing cities in the United States and has one of the nation’s largest concentrations of corporate headquarters for publicly traded companies including 9 Fortune 500 companies. In fact, Dallas-Fort Worth, thanks to the soaring number of venture capitalists and integration of technology into the city landscape, ranks #11 on Business Insider’s most high-tech cities in the world. It is also home to some of the most well-known corporations like Southwest Airlines, AT&T, Exxon Mobile, and Texas Instruments. The Bryan Street Data Center provides interconnection and colocation services from the heart of downtown Dallas and is ideal for business in the southwest, southeast, and even internationally. With ultra-low latency connections to Denver, Phoenix, Chicago, and Atlanta, this NewCloud Cloud Hub is prime to meet the growing needs for space and connectivity of today’s businesses. 24/7 on-site security personnel, biometric scanners, and photo badge access helps keep the Digital Realty Data Center secure.